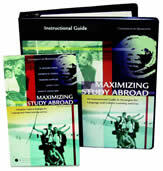 This unique set of guidebooks helps students, program professionals, and language instructors make the most of study abroad through strategies for both language and culture learning and use. Aimed at students who want to make the most of their study abroad experience, this flexible and user-friendly guide helps students identify and use a wide variety of language- and culture-learning strategies. The guide begins with three inventories designed to help students be more aware of how they currently learn language and culture. The following sections provide students with tools and creative activities they can use to enhance their favored learning strategies and try out unfamiliar ones. Students can use this guide as they prepare for study abroad, during their experience, and once they return to maximize their experience. We encourage you to take a look at some of the wonderful resources available in this guidebook. Sample segments of this guide are available for download (PDF format requires Acrobat Reader). The Students' Guide costs $12 plus shipping and handling. To order go to the CARLA working papers site. Discounts for ordering the Students' Guide in bulk are available. For quantities between 200-499 you get a 10% discount; from 500-999 you get a 25% discount; and over 1,000 we offer a 50% discount at a total cost of only $6.00 per book! See the bulk order form (PDF) for important ordering information. Created as a companion to the Students’ Guide, the new Instructional Guide provides language teachers and study abroad professionals with both a solid understanding of language and culture learning theory and concrete ways to use this knowledge to support students in their skill development. The guide is written with the busy professional in mind and features a “tool kit” of more than 100 hands-on activities that are ready for use in pre-departure, in-country, and re-entry initiatives for study abroad programs, as well as in language classrooms at home and abroad. With its creative activities, practitioner-friendly theory sections, teacher-tested tools, and professional advice, this user-friendly guide will allow you to quickly and easily integrate or adapt these new ideas to meet the unique needs of your classroom or study abroad program. The 566-page Instructional Guide costs $30 + shipping. It is available for purchase on Amazon.com. The Maximizing Study Abroad Series was created as part of a project sponsored by the Center for Advanced Research on Language Acquisition at the University of Minnesota and was supported in part by the U.S. Department of Education Language Resource Center program. Background information on the Maximizing Study Abroad Material Development Project (PDF) and the Research Project is available on the CARLA website.